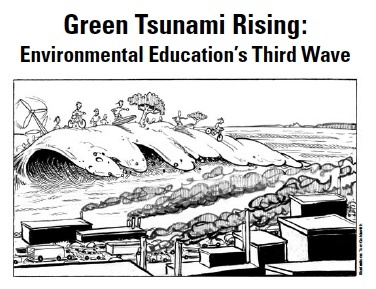 We are not the only ones thinking about environmental education! There is a legacy of writings that support what we all do. Collected on our bookshelf are some of these texts, research, reflections and guidebooks. Feel free to browse and if you have something to add, please contact diana@abcee.org. There is always room in our virtual bookcase. Measuring the Success of Environmental Education Programs is an easy to follow guide to evaluating your environmental education programs. 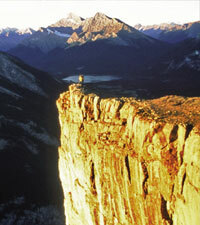 Thanks to CPAWS Calgary/Banff and Sierra Club of Canada for permission to offer a pdf version of this document. In 2015/16, ACEE created Measuring What Matters, our recommendations on how to better connect with teachers. Recommendations are aimed at all organizations that offer programs, grants or awards, and are based on our focus groups and surveys of Alberta teachers that identified barriers, challenges and ideas on how to better engage teachers in accessing environmental and energy education resources - and measure the impacts. 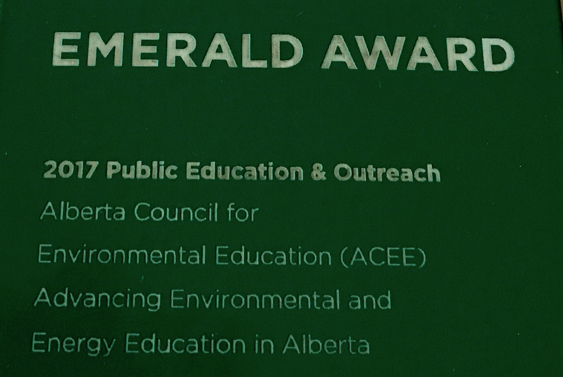 Thanks to the Alberta Emerald Foundation (AEF) for permission to share the Backgrounder on youth engagement together with What we Heard from the province-wide consultations conducted by ACEE, on contract to AEF. 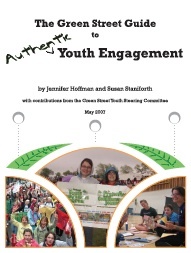 The Green Street Guide to Authentic Youth Engagement outlines some of the best ways to encourage authentic youth participation within organizations and includes practical advice and real-life examples. Five Minute Field Trips is a kind of ‘greatest hits’ compendium of experienced environmental educators’ favorite activities. 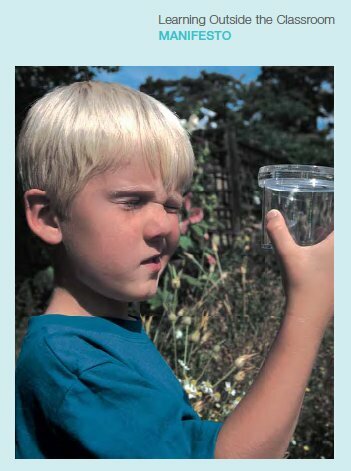 The guide is designed for educators looking for simple and enjoyable outdoor environmental activities they can do outside in a schoolyard or natural space. Created by the Alberta Teachers' Association Global, Environment and Outdoor Education Council (become a member to access the full resource), CPAWS Southern Alberta (has many of the activities online) and the Calgary Zoo. Building Outdoor Classrooms is a fantastic resource from TD Friends of the Environment for anyone who is considering building an outdoor classroom learning space. The guide provides an overview of everything from outdoor classroom design and planning, fundraising, how to gain support for your project, as well as real life case studies. 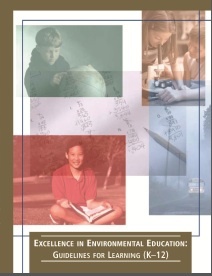 Excellence in Environmental Education Guidelines for Learning (K-12) (revised 2010) provides students, parents, educators, home schoolers, policy makers, and the public a set of common, voluntary guidelines for environmental literacy. 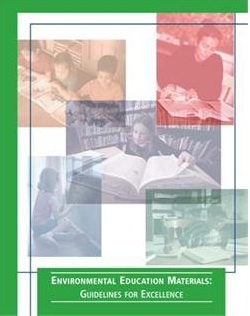 Environmental Education Materials: Guidelines for Excellence provides a set of recommendations for developing and selecting environmental education instructional materials. These guidelines aim to help developers of activity guides, lesson plans, and other instructional materials produce high quality products, and to provide educators with a tool to evaluate the wide array of available environmental education materials. 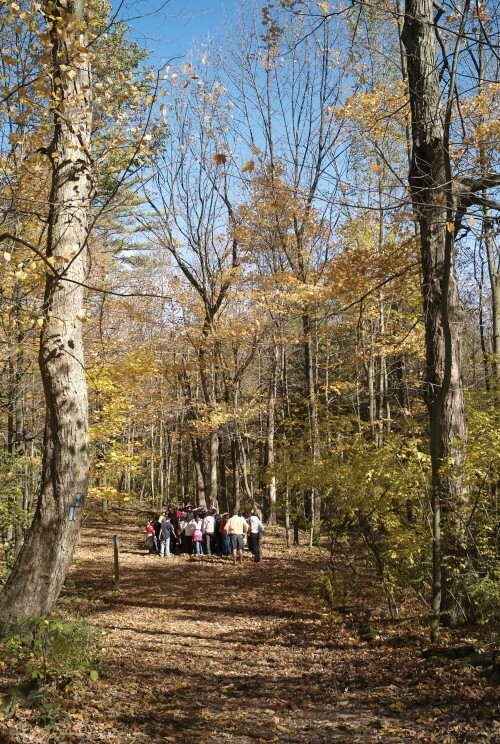 Nonfor mal Environmental Education Programs: Guidelines for Excellence offers a set of recommendations for the design and implementation of comprehensive nonformal environmental education programs. The Nonformal Guidelines outlines six key characteristics of quality EE program design and implementation. 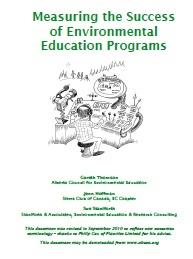 Guidelines for the Preparation and Professional Development of Environmental Educators offers recommendations about the basic knowledge and abilities educators need to provide high-quality environmental education. 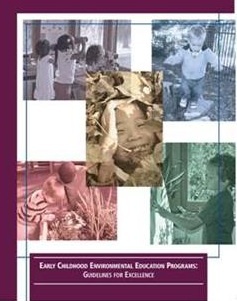 Early Childhood Environmental Education Programs, contains a set of recommendations for developing and administering high-quality environmental education programs for young children from birth to age eight, with a focus on ages three to six. Thanks to Green Teacher for permission to offer these relevant articles. ACEE has listed both peer reviewed and other forms of research. Compiled by the NAAEE Research SIG (Special Interest Group) and Cornell University. EEresearch highlights recently published refereed journal articles that contain results useful for educators. Short overviews and published abstracts are posted weekly. Its overall goal is to help educators adapt and improve their practices to reflect current research. Closing the Achievement Gap prepared by the State Education and Environment Roundtable (Lieberman, Gerald A. & Hoody, Linda L, 1998) presents the results of a nationwide study using the Environment as an Integrating Context for learning (EIC). The report notes, “Using the environment as an integrating context is interdisciplinary, collaborative, student-centered, hands-on and engages students in learning”. Their research shows that student learning shows improvement in reading, writing, math, science and social studies; exhibit increased pride in their accomplishments; greater engagement and enthusiasm for learning; better ability to apply science to real-world situations; better application of systems thinking; increased ability to think creatively; and more advanced skills in applying civic processes to real-life situations. Pacific E ducation Institute is a project-based inquiry program in Washington State that has undertaken various research initiatives using the environment to integrate subject areas and the results in measurable improvements in student learning. Eviden ce of Impact of Sustainable Schools, published the University of Bath’s Centre for Research in Education and the Environment for the United Kingdom’s Depart of Education outlines the educational and social benefits to young people of learning in sustainable schools. 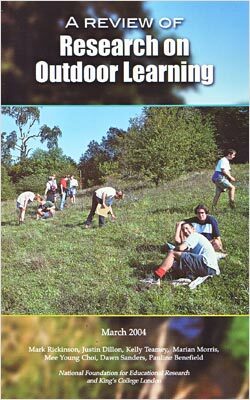 The National Foundation for Educational Research conducted A Review of Research on Outdoor Learning critically examining 150 pieces of research on outdoor learning published in English between 1993 and 2003. 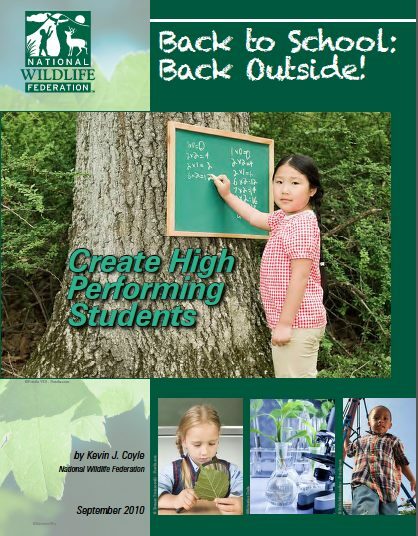 Back to S chool: Back Outside from the National Wildlife Federation documents how outdoor time boosts academic performance. 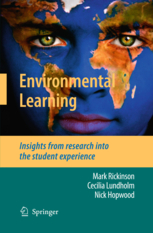 Environm ental Learning: Insights from Research into the Student Experience is a book that outlines how school and university students experience and respond to learning activities related to environmental issues. A Bibliogr aphy of Environmental Education – Education for Sustainability Research (2000-2011) is a comprehensive bibliography of Environmental Education – Education for Sustainability Research developed by Michael Mappin. 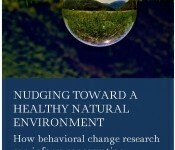 Nudges for Conservation Synthesizing research in psychology and behavioral economics, this report identifies five areas : attitudes, agency, emotions, social norms, and environmental or decision context -- that can be influenced to improve the outcomes of conservation programs. Ger ald Lieberman's new book is an innovative guide to creating and implementing a new type of environmental education that combines standards-based lessons on English language arts, math, history and science with community investigations and service learning. Environmental Outdoor Education and Exposure to Nature: The Positive Effects on Student Wellness and Academic Achievement is an annotated bibliography by Bill Bagshaw for his Masters Degree in Secondary Education at the University of Alberta. It provides an extensive list of research on the effects of outdoor education on mental well-being, abilities and physical wellness. The school board plans are part of a larger commitment to sustainability that is demonstrated by engagement with staff, students and the broader community. 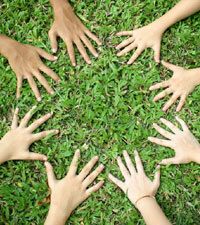 Each sustainability plan conceptualizes sustainability in a holistic way and includes concepts of equity and democracy. They also identify specific sustainability objectives and actions, and include reporting mechanisms. The Calgary Board of Education's sustainability focus includes a Sustainability Framework and its Three-year Sustainability Plan for 2014-2017. Vancouver School Board's Sustainability Framework - September 2010. Winnipeg School Division's Sustainable Development Plan - 2015 to 2018. 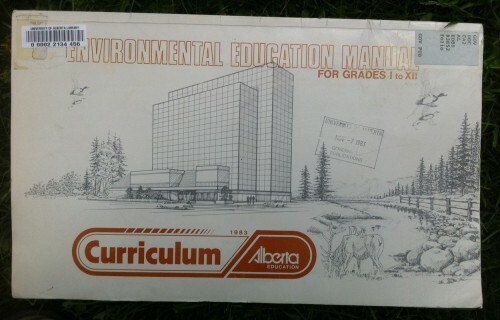 Environ mental Education Manual for Grades I to XII (1983) was developed as a Curriculum Guide by Alberta Education. Available only in hard copy in a few select libraries. A well-developed guide that could help guide the current work of Alberta Education. The O ntario government has endorsed a plan it commissioned, entitled Acting Today, Shaping Tomorrow. 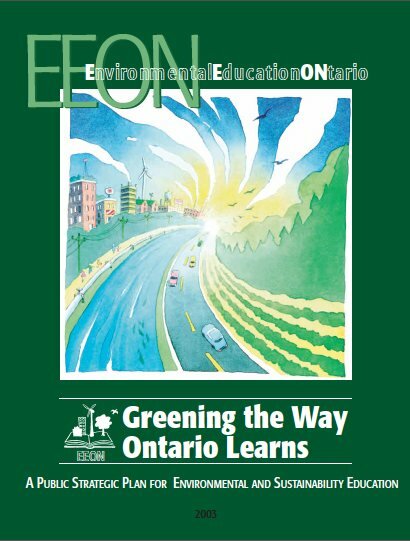 The O ntario government created a series of documents to support environmental education in Ontario schools. Environm ental Learning and Experience – An Interdisciplinary Guide for Teachers was created by the Ministry of Education. How S ustainability Education? 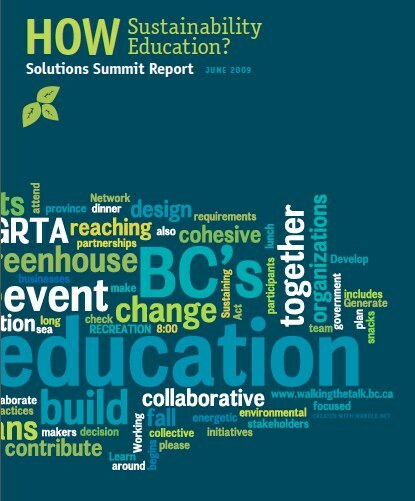 A Solutions Summit Final Report produced by the BC Working Group and Network on Sustainability Education as a report on a one-day summit held in 2009. 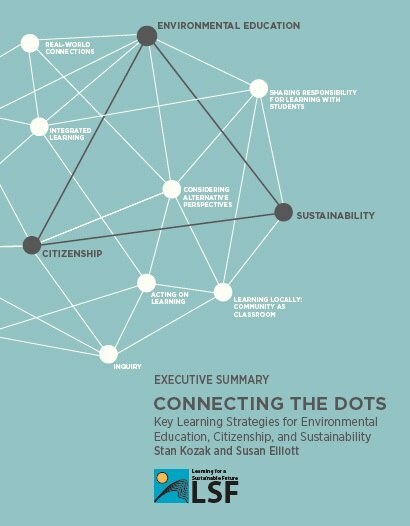 The summit moved the dialogue from “why sustainability education” to “how sustainability education” and the report summarizes eight action themes to serve as a roadmap to education as sustainability. Manitoba The Manitoba Ministry of Education consistently weaves Education for Sustainable Development into its K-12 program of studies. They have developed a guide to assist Manitoba curriculum developers and educators to integrate sustainability concepts into new and existing curricula. The Qu ebec Teachers' Union has developed an exciting and popular whole-school model known as Établissements verts Brundtland (EVB - Brundtland Green Schools). 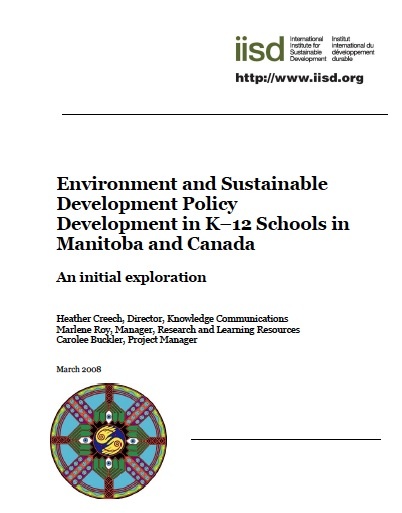 International Institute for Sustainable Development has an analysis of environmental and sustainable development policy development in school districts in Manitoba and Canada. The paper includes numerous examples of school and district initiatives from Canada and other jurisdictions. 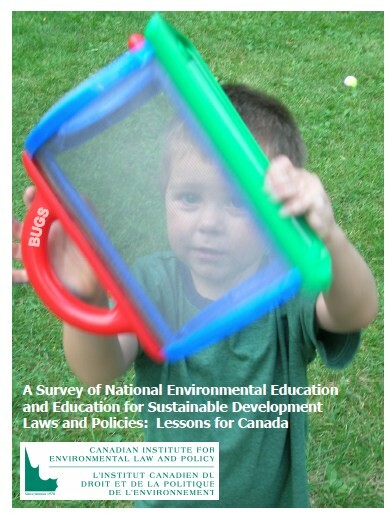 The Can adian Institute for Environmental Law and Policy (CIELAP) has drafted an excellent 2006 document entitled Survey of National Environmental Education and Education for Sustainable Development Laws and Policies: Lessons for Canada. 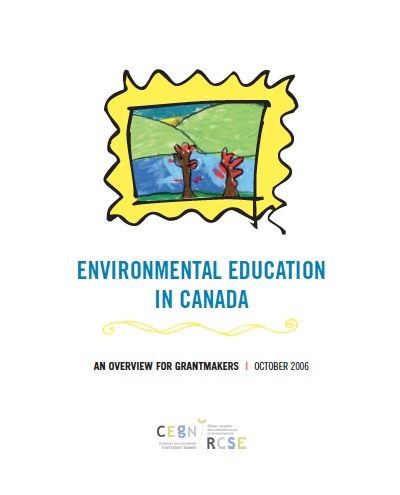 The Ca nadian Environmental Grantmakers Network (CEGN) created a 2006 issue brief entitled Environmental Education in Canada, which outlines some key policy approaches and strategies. Learning Outside the Classroom Manifesto developed by the United Kingdom’s Department of Education sets out a vision to enable every young person to experience the world beyond the classroom as an essential part of their learning and personal development. ACEE is busy compiling resources that show how outdoor and experiential education contribute to wellness. Here is a starting point - and you can also search our Resource Centre. 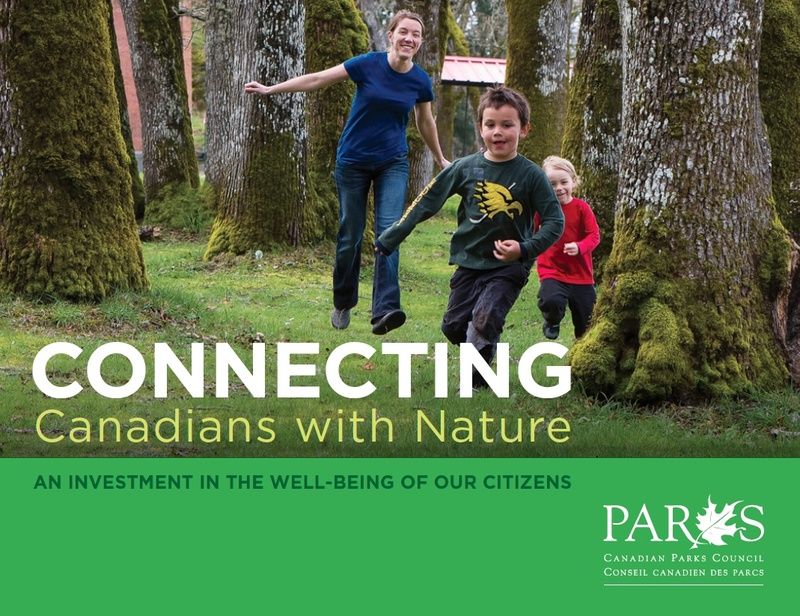 Connecting Canadians with Nature: An Investment in the Well-Being of Our Citizens is a report that provides an overview of the benefits of connecting with nature that is a well researched and referenced report from the Canadian Parks Council. 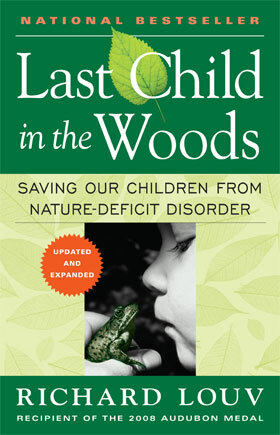 Richa rd Louv in “Last Child in the Woods” coined the phrase ‘nature deficit disorder’ to describe the negative effects of children not spending time in nature. He brings forward the growing body of research indicating that direct exposure to nature is essential for healthy childhood development and for the physical and emotional health of children and adults. 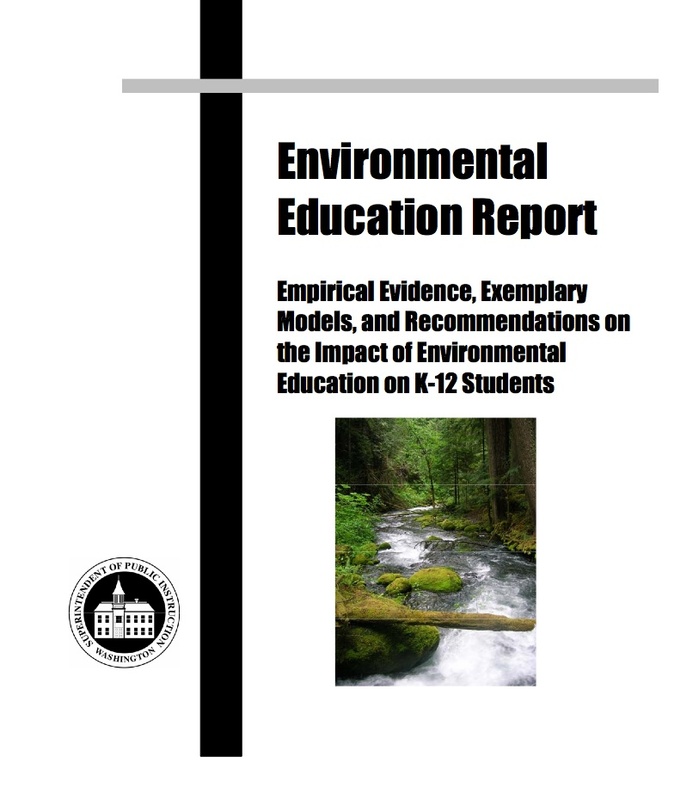 Enviro nmental Education Report- Wheeler and Thumlert, et al (2007) examined 76 studies from US state, national an international sources and ranked them according to methodology and outcomes. 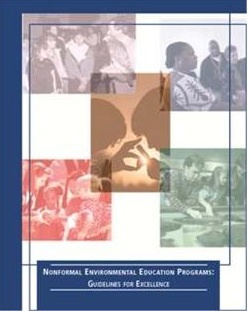 Their findings indicate that environmental education allows for the ready integration of many techniques that are thought to define good education; the multi-faceted nature of environmental education is a key component of its effectiveness; and increases in math and science achievement, some increases in social studies and mixed evidence that it increases language arts achievement. The David Suzuki Foundation's - Connecting Youth with Nature initiative has a Superhero Challenge program and a number of Nature as a Classroom guides for grades K to 8 in English and French. 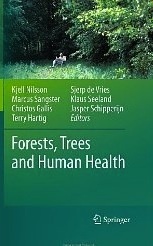 Forest, Trees, and Human Health - Exploring the relationships between health, natural environments in general, and forests in particular, this groundbreaking book is the outcome of the European Union’s COST Action E39 ‘Forests, Trees and Human Health and Wellbeing’, and draws together work carried out over four years by scientists from 25 countries working in the fields of forestry, health, environment and social sciences. While the focus is primarily on health priorities defined within Europe, this volume explicitly draws also on research from North America. 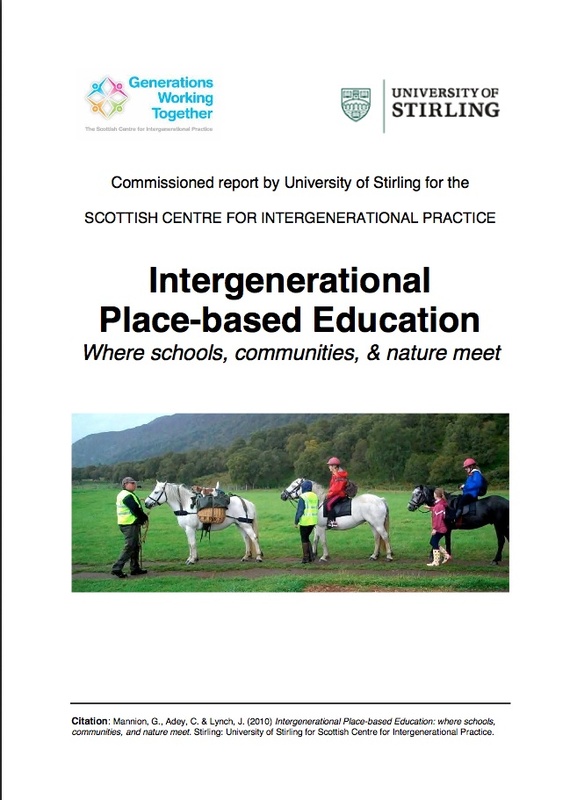 Intergenerational Place-based Education- Mannion and Lynch (2010) found that environmental or place-based education that incorporates children and adults learning together improves intergenerational relations and individual, community, and ecological well being. Their research encourages schools to include intergenerational learning, contextualize curricula in the environment and embrace outdoor learning. 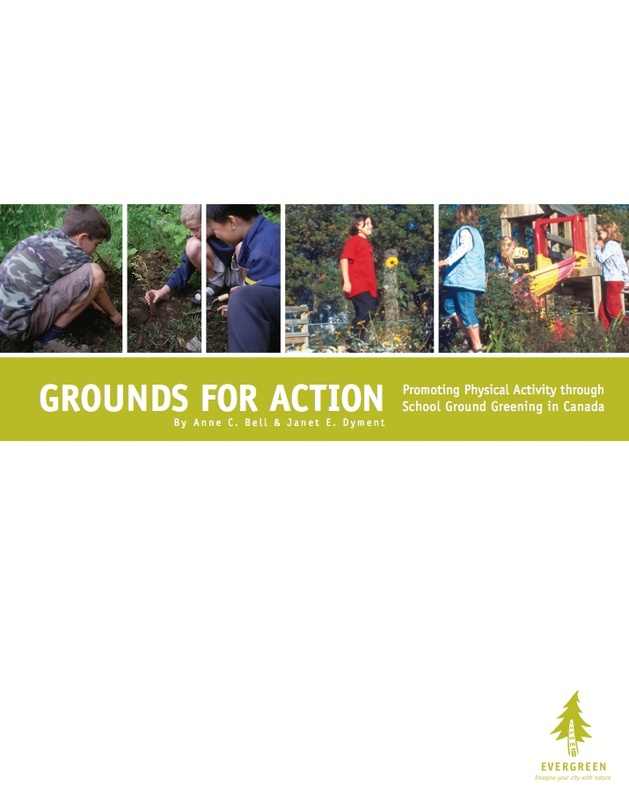 Grou nds for Action - Bell, Anne C and Dyment, Janet (2006) found that children who experience school grounds with diverse natural settings are more physically active, more aware of nutrition, more civil to one another, and more creative. One of the major benefits of green school grounds is increased involvement by adults and members of the nearby community, from helping with gardens to enriching the lifescape of the school grounds. Time in Ou tdoor Classroom is Irreplacable - Short article profiling a program in California that connects students with nature and science. A Hea lthy Dose of Education - An article from the Huffington Post discussing the 'no child left inside' initiative in the United States. 10 Ways t o Come Alive in Nature - This article from the Child and Nature Network in the United States details easy ways to connect with nature. 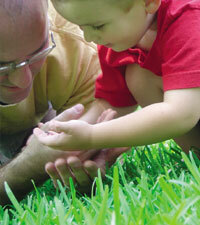 We’ve compiled some resources that help guide environmental education - and outdoor play! - during early childhood. Here is a starting point – and you can also search our Resource Centre. Con necting With Nature: an educational guide for kindergarten is a resource designed to help educators connect their students to nature, help them understand how their actions can affect it, and empower them to bring about positive change. Connecting With Nature: an educational guide for grades one to three is a resource designed to help educators connect their students to nature, help them understand how their actions can affect it, and empower them to bring about positive change. 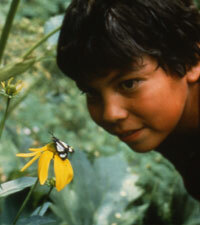 Early Chi ldhood Environmental Education Programs-Guidelines for Excellence is the latest in a series of documents published by the North American Association for Environmental Education. The project is committed to synthesizing the best thinking about environmental education through an extensive process of review and discussion. Empowering the Next Generation To Connect With Nature: A Global Movement and in particular, Stream 8: Inspiring a New Generation, is focused on a legacy whereby future generations will develop and nurture life-long relationships with nature and the support from conservation that flows from that connection. Forest and Nature School in Canada: A Head, Heart, Hands Approach to Outdoor Learning is a resource focused on new approaches to nature-based learning. Interna tional Journal of Early Childhood Environmental Education (Winter Edition) focuses on addressing issues, policies, practices and research that matters for early childhood environmental education. Nature Pla y and Learning Places offers a set of guidelines for those that create, manage or promote development of nature spaces in the everyday environment of children, youth and families, especially in urban/suburban communities. The goal is to attract kids and families outdoors to interact directly with nature. Helping Children Love the Earth Before We Ask them to Save It. This short four page article summarizes the research into nature connection and its benefits. To see more research from the Dimensions Educational Research Foundation, click here. Learning to Love the Natural World Enough to Protect It is an article from Louise Chawla that makes the connection between early childhood experiences outdoors with a caring adult and environmental action later in life. 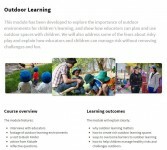 Outdoo r Learning is a module developed to explore the importance of outdoor environments for children's learning, and show how educators can plan and use outdoor spaces with children. This resource is available to download for a small fee from Early Childhood Australia Learning Hub. Click here to subscribe to the Natural Start newsletter, published each month by the Natural Start Alliance. Early Childhood Activities for a Greener Earth contains more than 100 classroom activities to help children learn about and care for the Earth. ( Available for a fee-click on the link above). The Guide to Education for Sustainability offers introductory tools, background, and examples to help educators of all grade levels and subject areas use the "lens of sustainability" to strengthen classroom curricula and community projects. 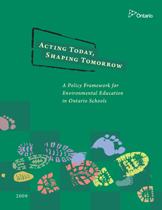 DEEPER: Deepening Environmental Education in Pre-Service Teaching - a resource guide for formulating a new vision for pre-service environmental education in Ontario - applicable for other regions as well. Pathway to Stewardship is a framework providing a guide and roadmap towards stewardship. It covers every stage of a child's development using a series of benchmarks or goals. It is grounded in extensive research and interviews with 75 community leaders. Pathway to Stewardship is a call to action for everyone who plans for or spends time with children - parents, teachers, relatives, community groups, health professionals and government agencies. It forms a basis for community discussion - a place to start. It begins in Peterborough, ON but can be expanded and applied to other regions. Connecting the Dots (2014) focuses on learning strategies and the ways of organizing learning exper iences; the “how to” of learning. These learning strategies involve students as engaged learners, learning within the context of their communities and addressing relevant, local issues. Council o f Ministers of Education in Canada (CMEC) released a background paper – Developing a Pan-Canadian Education for Sustainable Development Framework for Collaboration and Action to provide the international context for work on ESD in Canada and to lay out CMEC’s commitment to ESD. 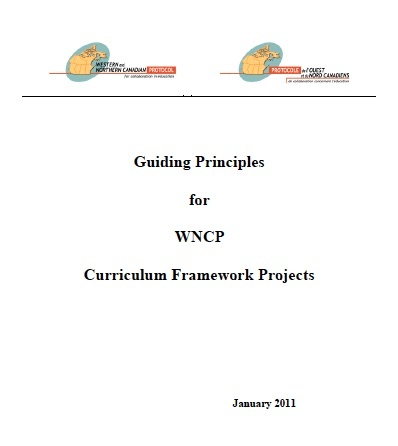 The West ern and Northern Canadian Protocol (WNCP) has drafted five guiding principles to serve as starting points for rethinking curriculum frameworks. The work of WNCP is providing a common vocabulary and a broad vision for the development of 21st century curriculum frameworks. Learn ing for a Sustainable Future as a partner in the Education for Sustainable Development (ESD) Canada has created theme documents on a variety of topics that help educators and curriculum designers understand ways to engage students that are appropriate for the various levels of development. Calgary Board of Education (CBE) has helped ‘show the way’ with a revolutionary framework to advance environmental stewardship that links energy conservation, environmental education, and community integration. The No rth American Association for Environmental Education (NAAEE) has developed a network of state and provincial associations that support environmental education – the ‘Affiliate Network.’ The NAAEE Affiliate Network includes links to environmental education state legislation. The Can adian Network for Environmental Education and Communication (EECOM) is committed to building capacity for environmental education across Canada. The capacity building subcommittee has drafted a 4 page resource entitled Tools to Build Capacity in Environmental Education. 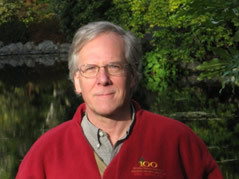 Dr. Rick Kool is a former Program Head for the Master of Arts in Environmental Education and Communication at Royal Roads University in Victoria. 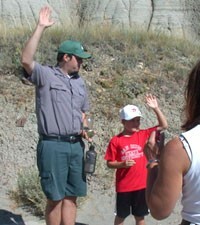 He thinks deeply about environmental education and his presentations are always valuable and worth seeing again! Below are two powerpoint presentations from Dr. Kool. Etienne W enger coined the term Communities of Practice. This webpage gives an excellent summary of what CoPs are and how they could operate. 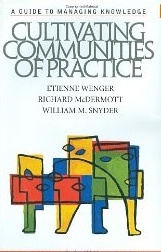 Cultivating Com munities of Practice: A Guide to Managing Knowledge by Etienne Wenger, Richard McDermott, and William M. Snyder describes how Communities of Practice might be purposely developed as a key driver of organizational performance in the knowledge age. Seven principles for cultivating communities of practice is a valuable excerpt from this book. Cultivation a C ommunity of Practice - a quick start up guide is a one page summary of considerations when starting Communities of Practice. 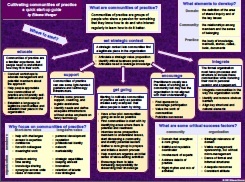 A Com munity of Practice on Community of Practice! This group has forums and workshops about CoPs and a well stocked Wiki full of resources and links. 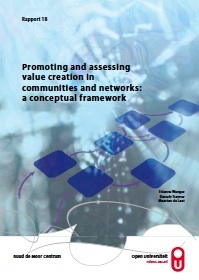 Promoting and assessing value creation in communities and networks: a conceptual framework looks at one way to evaluate the value of Communities of Practice and networks. The general website also has some useful resources. The Partnership Handbook is designed to provide information, tips and questions about the basics of partnerships, which can be applied to your own circumstances. The creation of this 90 page document was funded by Human Resources Developlement Canada. Using E mergence to Take Social Innovation to Scale is an article by Margaret Wheatley looking at the characteristics of networks and how they can lead to change. 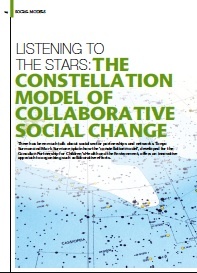 The Constella tion Model for Social Change comes from the Centre for Social Innovation in Toronto. An interesting way to look at how groups come together to tackle a common issues or challenge. GEO and Monitor Institute partnered to release Catalyzing Networks for Social Change, to explore what it takes for grantmakers to cultivate a network mindset, offer recommendations for how funders can effectively build the capacity of networks and identify five network approaches that are helping grantmakers and social change makers to harness the power of networks.